This week 55 players enjoyed the format of the yellow ball competition with members of the 4 person team taking turns to take the pressure of their score having to count. I was fortunate to have 3 great partners who covered my generally poor play with some great golf and we ran out easy winners. For a change we had the presentation at Scottees restaurant and bar in El Pareton. This was followed by a crazy golf competion on some of the worst fairways and greens I have ever played on! I would suggest that the head green keeper is sacked! Hole 5 was particularly difficult with the hole on top of a mound with crazy paving for a green! Adults and children competed with Tom Erik finishing up as the winner. This was followed by a barbeque, then a quiz and play your cards right. Cath did a great job of organising the event and a 55 seater bus. Kev spent all night running the crazy golf competition. Next week is the biggest event of the year – captains day. Anyone who wants to play and has not already got their name down needs to act quickly – starting times are filling up. Also Cath will need to know by Wednesday who wants to attend the prizegiving, buffet and entertainment at the Sensol hotel at night. Just thought I’d start the blog off with some pictures from our fantastic fiesta. Really well organised and a credit to mileniun and all the helpers who made it happen. With the weekly (and very busy) Saturday night market following and then a live group in the Al Kasar the resort is unrecognisable from the sleepy days of only a few weeks ago! A really busy week with many holidaymakers arriving and joining the society. Over 30 new recruits this week taking the total membership to over 530. The 1st 500 members will be entered into a free draw to mark this milestone. We have had 132 played this week over Monday, Wednesday and Friday with a new record entry on Friday of 67 players for the 3 person team event. Amazingly, all 67 who entered actually turned up and paid their entry fee! For some reason the greenkeepers chose Friday to slit all the tees, resulting in the yellow tee box markers being moved back to the professional tees on about 9 holes. Despite being informed there was a big competition taking place they then moved the tee boxes back to the forward tees halfway through the comp making the course much easier for the later starters. Not the players fault so we had to accept their scores. However the winning team was 2nd out and played from the back markers. Paul Harrington, Fran Thomas and Gert Willumsen amassed 88pts off low handicaps winning by a massive 9pts. 2nd place was taken by George Hoskins, Kevin Smith and myself (79pts). One point further back were Richard Connock, Jacob Connock and Peter Jones. Apart from the main prizes we had a card draw for one of the unsuccessful teams to win a condado golf towel each (donated by the society). This was won by the team of Reinhold Svensson, Jo Harris and Peter Davey. 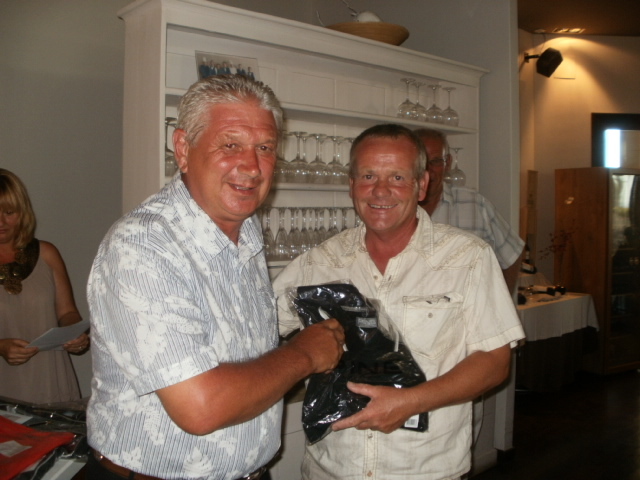 Following the prizegiving the committee were all presented with a golf shirt by Jan Olsen from his norwegian company (El-tavle GRENLAND) in recognition of our efforts serving our Condado golfing public. It was very much appreciated by us all – thanks Jan! Today (Sunday) is an open competition organised by the fiesta committee with prizes being donated by Olagolf. The fiesta so far has been a great success with hundreds of residents joining together yesterday for free paella and beer, followed by live music in the Al Kasar. Next Friday is the lone ranger competition (a team of 4 with one player having the yellow ball at each hole). For a change we are having the presentation at Scottees (El Pareton) where Cath has arranged a family fun day including a crazy golf comp for all the family. There will be a barbeque included for 8 euros adult or 4 euros (children). Transport return is 5 euros if required. Contact Kev or Cath if you want to book. The week after (Friday August 5th) is the main competition of the year (Captains Day). This will be an individual stableford event but players must have played with us before to win the main prize. There will be many prizes with divisional awards, longest drive, nearest pin, prize for 2’s etc. The sheet is already up in the golf shop so if you want an early time (they will soon go) put your name down now or contact me. If you want to go to the presentation at the Sensol hotel (Camposol) – again contact Kevin or Cath. It is 12 euros for the buffet and entertainment by the fabulous Beagles and 5 euros if you need transporting there and back. 2 free raffle tickets will be included for the many sponsored prizes. Society golf shirts are still selling well and we have ordered some golf balls with our society logo on them. We expect to break more records for competition entries shortly with apartments selling well (I believe the banks have only 100 properties left). No news yet on a clubhouse but it is good to know that the Sports bar will open shortly down in Jardin 6. The courts have been repaired and will be in use at very reasonable prices. The society will hopefully add our support to this much needed facility. Finally our thoughts go out to the norwegian people after the terrible events of Friday. We have many norwegian members who are great friends and we hope all their friends and family are safe. A lovely day for golf with some scattered clouds and a fresh breeze keeping the 50 players cool for the two major competitions. I was at the 1st to announce all players onto the tee (Ivor Robson watch out!). They were greeted by applause from the gallery (no pressure there then!). 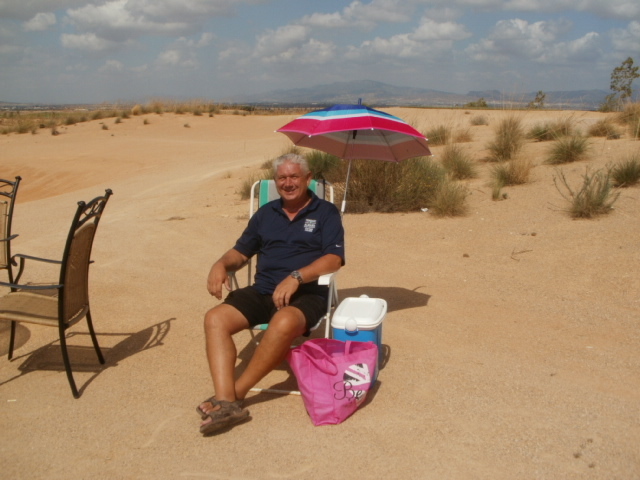 When all players were on their way I got back to the 12th tee where table and chairs were ready for the players to take a short break, with Sue and Eleanor supplying a variety of free drinks and melon wedges. 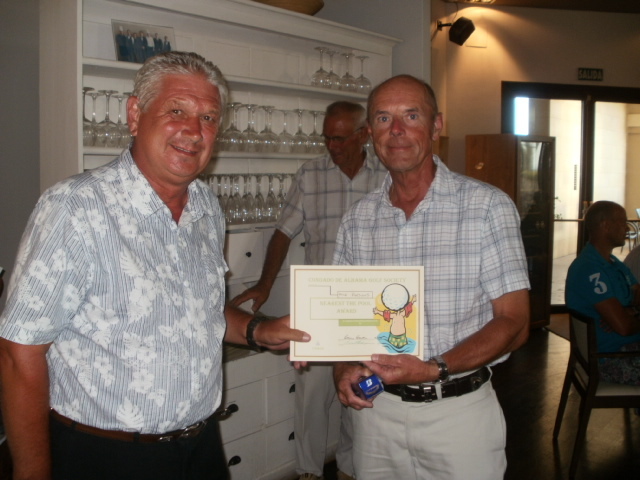 I then had the chance to watch the nearest the pin comp on the 11th, and the 1st shot I saw was the winner (Jostein). Then it was onto the 18th watching attempts at the longest drive and collecting cards. Possible winners were informed they should attend at night to get a prize. I did choose the format to really test the golfers where every shot counts towards a gross score – no picking up after a bad hole with no points – keep hitting the ball (no matter how many times) until it is in the hole. I knew this format would favour the better golfers and so it proved. The winner of the top prize with a nett score of 68 was Paul Harrington playing of a handicap of 4.8 and In 2nd place was Gert Willumsen with a 69 (off 9.4). Paul would also have won his own scratch cup with a gross score of 75 but he had said in advance that he would not compete for the trophy he had donated. This meant that Kell Jensen took the cup with a gross 80 (he plays off 8 handicap) closely followed by Stuart McColm and Gert with 81’s. So Gert took the 1st division prize with the ever so consistent Paul Briggs one shot behind on 70. The 2nd division players struggled with the strokeplay format with a score of 75 nett being good enough to take the 1st prize. 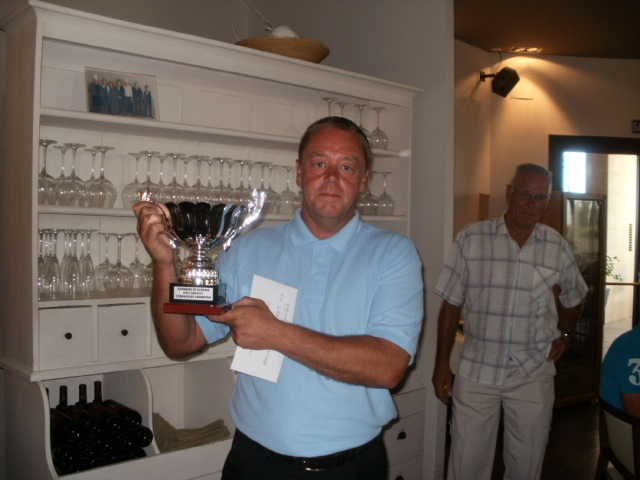 Three players were tied on the score with David Wareing losing out on a prize through a countback on the last 6 holes. How David must have regretted that 9 on the last hole! Just pipping him to 2nd place was Jan Holdhus, but it was Kevin Smith who finished 1st due to having taken one stroke less than the other 2 on the back 9 holes. Joan Scanlan from Ireland won the ladies prize with a score of 74 closely followed by Astrid Spieler one shot further back. John Brown was nearest the pin on the 11th with a magnificent shot over the water to 6 inches. However as he was not coming to the presentation and was returning to the UK in the morning he kindly passed the prize to the next closest which was Jostein Landsvik. The closest shot on the 17th was by Joan Scanlan winning her 2nd prize of the day. The longest drive was on the 18th which I chose for the narrowness of the fairway short of the green. So the longest drive may have been in the water of the rough (must be on fairway), bringing players with less length and more accuracy into play. This showed when Stuart McColm hit a fantastic long ball which rolled off the fairway and into the water. For a long time it lookes as though Fran Thomas had it sown up with an unbelievable drive just short of the green and in the centre of the fairway. But not to be – in the last match Richard Connock smashed his drive 8 yards past Fran!. Richard was left with nothing else to play for after his 13 on the 13th (how unlucky was that!) had ruined a previously good round. Cath & Kev came up with a late prize = a certificate for nearest the pool on the 12th! This was won by Mick Parsons with a great right hook. He had to trample through bikini clad bodies supposedly looking for his ball! 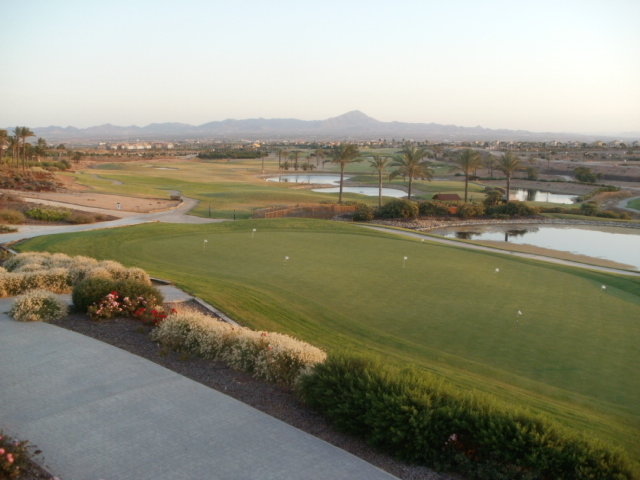 90 people attended the presentation at the Hacienda del Alamo golf club. After the presentation we had a free draw for golf prizes. Prize winners were not included. 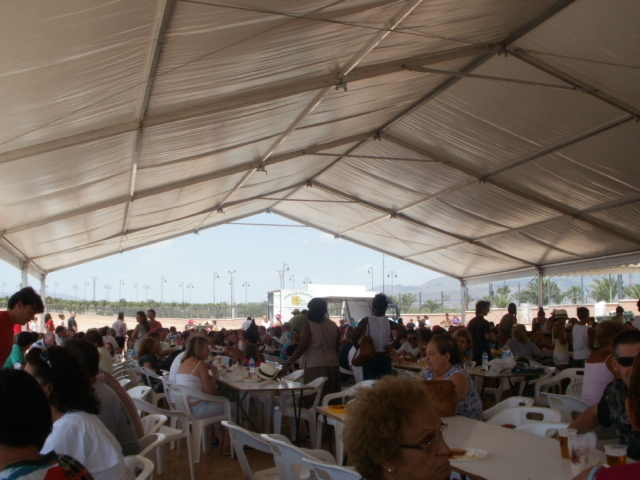 Also raffle tickets were given to all the guests and over 20 donated prizes were given out. Thanks to all the sponsors for their kind donations (acknowledgements can be found below). I thanked Olagolf for their gift of a round for 2 with buggy (worth 100 euros) for the Barry Barker Strokeplay winner and also Hacienda golf who also matched that for the Paul Harrington Scratch Cup. 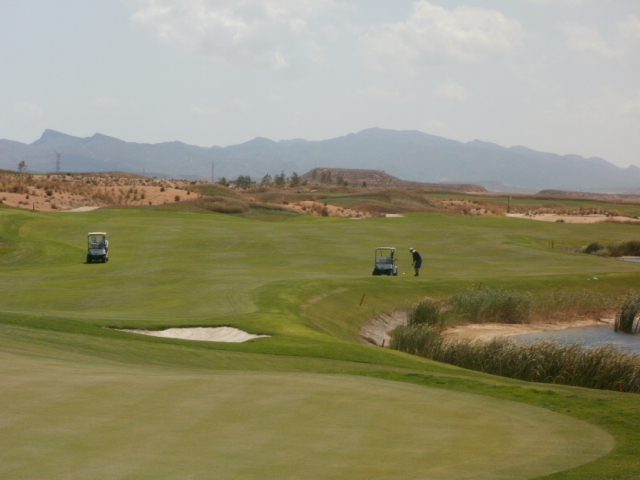 Don’t forget all Condado society members can play Hacienda any day of the year for 35 euros. Just phone in advance on 0034 968157236 and show your green membership card. We should try and support Hacienda more – I have put a start sheet in the shop to have an awayday at Hacienda next Wednesday. Next Friday it is a 3 person team event so get your name down and mark (B) if you require a buggy (subject to availability). 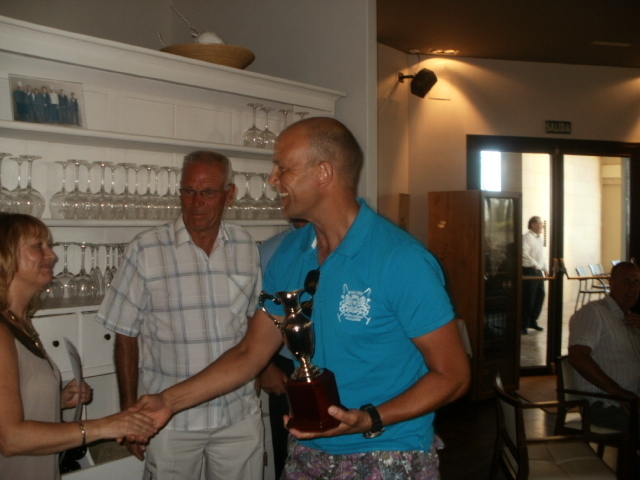 Thanks to every one who supported my day either as a golfer of a part-goer – I really had a fantastic time. 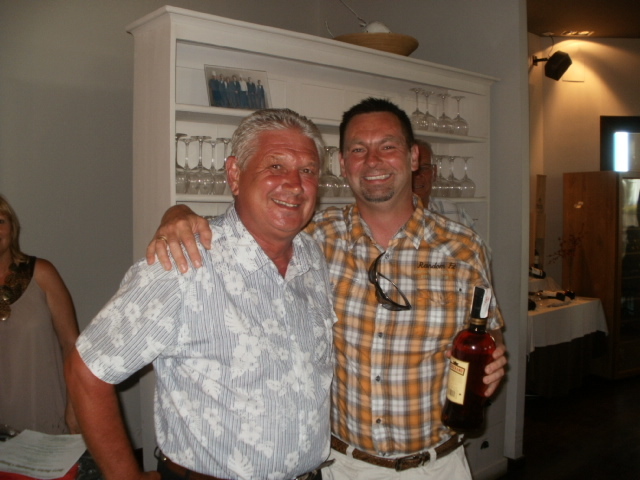 The good times never end – everyone is welcome to come to my pub crawl around the marina in Puerto de Mazarron on Monday night to celebrate my 65th birthday! Yale distress alert system………………….Boomerang prize – is donated back every year! Thanks very much to all our sponsors it is very much appreciated. July 15th – 2 majors for the price of one! Just a last update on the this Fridays big day. Entries are already really good with the usual Wednesday night entries still to come. Two major trophy to play for – the Barry Barker Strokeplay championship which is our first strokeplay event – no stableford points in this one! Also it is an ideal opportunity to reward our better players with a gross score prize for our best golfer (the Paul Harrington Scratch cup). We will try to recreate the atmosphere of the British Open which also takes place this week. I will be on the 1st tee to collect entry fees, explain the rules and announce the players onto the tee. The prize for the Paul Harrington Scratch Cup will be a replica of the Open trophy – the claret jug. When the players are all away I will move to the 11th to oversee the first nearest the pin prize. The next hole (12th) will see Sue and Eleanor providing all the players with ice cold drinks (free!). The next nearest the pin will be on the 17th. Then I will go to the 18th where I can keep an eye on the longest drive. I picked that hole so the the prize may not necessarily go to the longest hitter – they may hit it so far that it runs into the lake on the left or the rough on the right! So more players will be in contention. Any one with a poor score can really have go for it! I can then collect all the cards and make sure the players have filled them in correctly and signed them. Also anyone with a good score will be informed that they must attend the evening presentation to receive any of the major trophies. 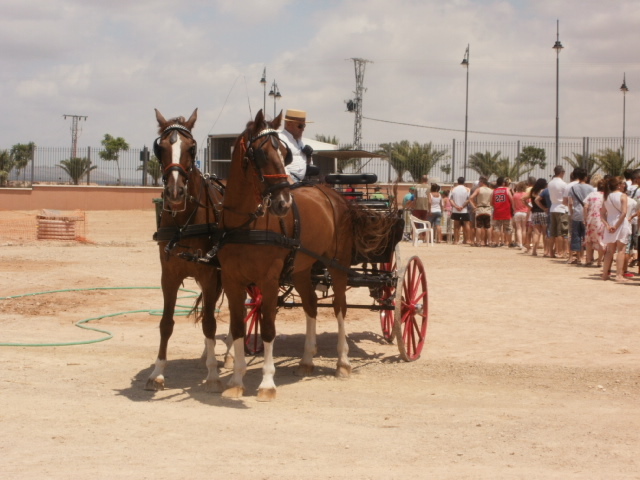 We are picking up at 6.15pm in the Al Kasar car park to go to Hacienda del Alamo. The presentation will take place first followed by the 3 course meal, then Barrington will entertain us. If you want to attend and have not booked contact Kevin at Kevin@cdagolf.com We have booked two 55 seater buses and expect this to be our biggest event yet. If you are not playing you can still bring family and friends at night for 12 euros for the meal (under 14’s 1/2 price) and 6 euros for the transport. We have some good sponsors who will all be mentioned on the night and in next weeks society blog. Special thanks to our two major sponsors Olagolf and Hacienda del Alamo for donating prizes worth 100 euros each to the major competition winners. It will be a great day for our society members, guests and family. This week we had a great entry of 48 players. The last few weeks have been very quiet but now summer is here the holiday makers are filling Condado up. The norwegians are back and two of them took the honours in the first division and ladies sections. Next week is the double header major with players playing strokeplay for the only time this year. There is the Barry Barker Strokeplay Championship and the Paul Harrington Scratch Cup. All players are eligible for both trophies as in Pauls competition the only requirement is to mark your gross score at each hole (no points) – the winner will be the player with the lowest gross score. The other competition also requires players to record their gross scores – the only difference is you subtract your slope handicap from the gross score then the winner is the player with the lowest nett score. There are two superb trophies at stake and lots of other divisional prizes, along with the longest drive (18th) and 2 nearest the pin competitions (11th and 17th). The presentation will take place at the superb Hacienda del Alamo clubhouse starting at 7.30pm. That will be followed by a free draw for various prizes, a 3 course meal (fish & chips for main) and entertainment by Barrington. The winners of the two major trophies MUST attend to claim their prize. Transport can be provided – Cath has already filled a 55 seater coach and is ordering a second. Only players who have played previously with the society will be able to win the main prizes, but anyone else who wishes to play their first game with us can play for the guests prize. There are already 40 names on the sheet for next Friday so it looks like it will be well supported. I will be on the first tee to collect entry money and explain the rules. Once they are all away I shall be at the 18th to collect cards and check the longest drive. I am looking forward to seeing battle commence! Another sunny day in Spain with 29 players this week. It was a pairs betterball comp and most teams were in close contention apart from one. 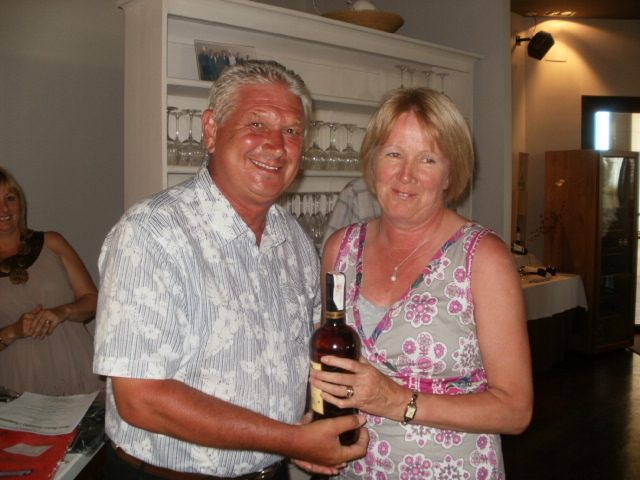 The society gives out prizes each month with the proceeds from membership fees. This week we had a card draw and gave away 2 towels and 2 caps to players who had not win a prize. It was also the 1st week that we changed from the bonus ball number to a domino card draw. We placed the dominoes in a bag and asked a member to draw a domino out. 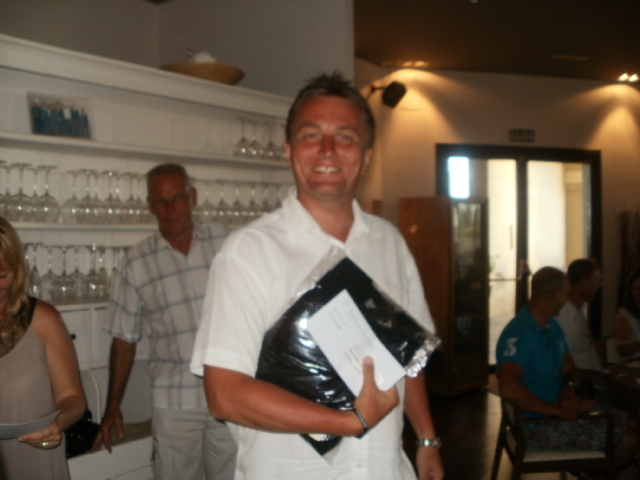 It was double 4 – winner (20 euros) Stephen Legg. Sheets are up in the shop for Monday, Wednesday and Friday. Friday is an individual stableford. In 2 weeks it is the Barry Barker Strokeplay Championship with the Paul Harrington Scratch Cup incorporated in the comp (2 majors on the same day). The presentation will be at Hacienda del Alamo golf club (19.30pm) with a 3 course meal (fish & chip night) followed by live entertainment from Barrington. There are raffle tickets included in the price with lots of prizes available. 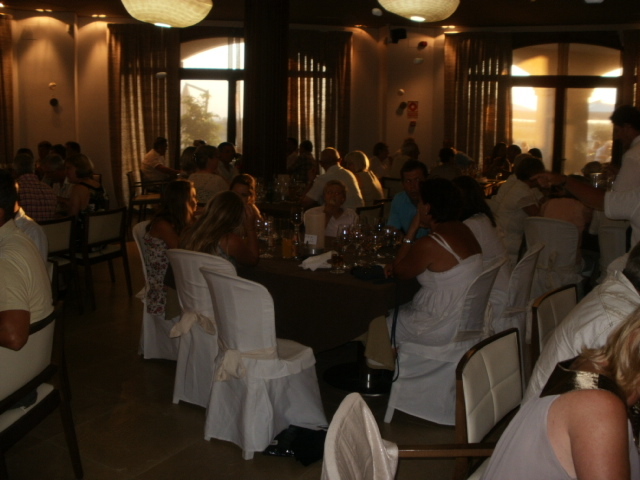 The meal is 12 euros and transport can be arranged if booked in advance at 6 euros per person. Everyone is welcome. 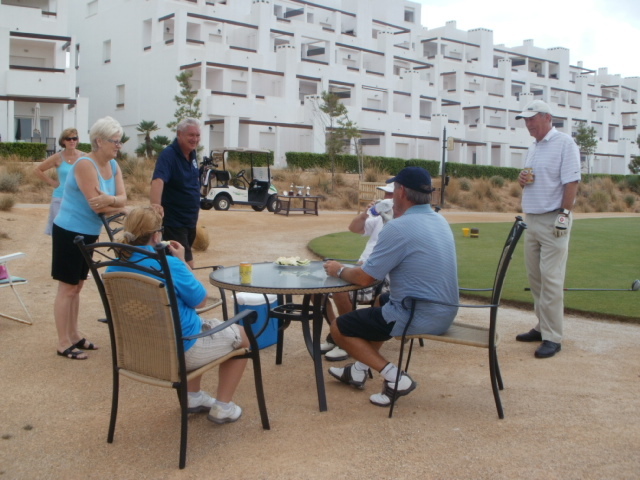 Please book your golf time and evening requirements as soon as possible so we can plan ahead. Curry night and quiz night is at Scotties on Tuesday July 5th. Again contact Cath if you want to go. Got to go back to UK early Saturday (only for 2 days thank goodness!) so blog published early this week.